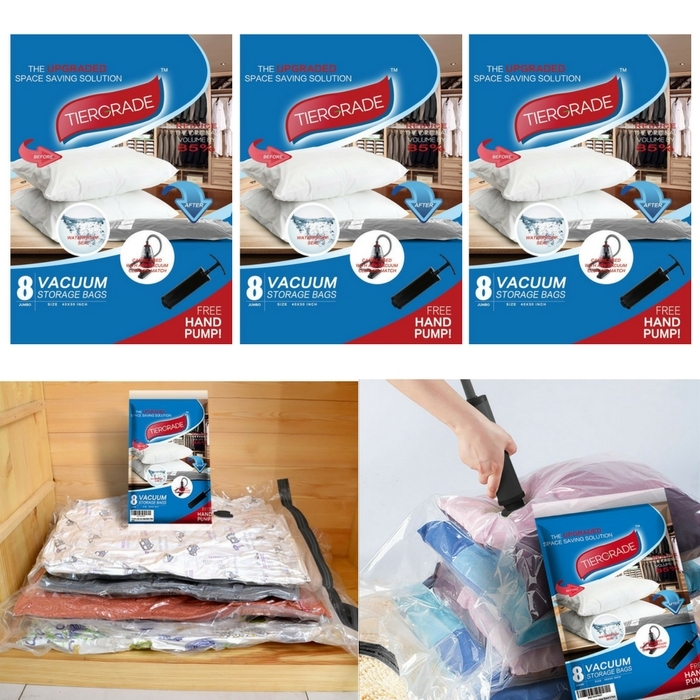 Tiergrade Premium Jumbo Vacuum Storage Bags Just $15.49! Down From $62.99! You are here: Home / Great Deals / Amazon Deals / Tiergrade Premium Jumbo Vacuum Storage Bags Just $15.49! Down From $62.99! Right now, you can get this great deal at Amazon! Tiergrade Premium Jumbo Vacuum Storage Bags for just $15.49 down from $62.99! It’s FREE shipping for orders over $35. When you want the very best vacuum storage bags for your big, bulky items that need to be stored for the season – or if you’re traveling and want to be as efficient as possible – these are the bags to get. With the jumbo size, you can fit anything and everything in these bags! Worry that you have too much stuff? You don’t have to! Even your biggest duvet or blanket or giant beach towels will fit snugly in these bags! What is sweeter is that we also enclose a travel hand-pump for free inside the package so you can bring it with you everywhere you go! The anti-mildew, anti-microbial, anti-mold, and WATER TIGHT features make these bags the BEST overall, for any purpose and under any conditions. Insects stay out so your clothes don’t get damaged! All orders come with a 100 percent money back satisfaction guarantee.